In addition to gardening, Julia Hawkins is an avid bicyclist. Photo by Collin Richie. At 103 years old, Julia Welles Hawkins manages to have seemingly unlimited energy. As inRegister documented in 2017, she is a champion bicyclist and runner, and she is outside nearly every day tending to her home garden. But Hawkins’ eye for natural beauty extends far beyond the borders of her own backyard. Hawkins fell in love with Louisiana’s lush ecosystem at a young age. In the early 1960s, when she was in her 40s, she launched a “Cherry Tree Spree” along Highland Road and in surrounding neighborhoods. With the help of her late husband, Murray F. “Buddy” Hawkins, and numerous volunteers, Hawkins successfully distributed hundreds of saplings for residents to plant in their yards. The neighborhood of University Acres planted 500 cherry trees alone in support of her cause. In 1967, she received an award for the project from the City Beautification Committee. 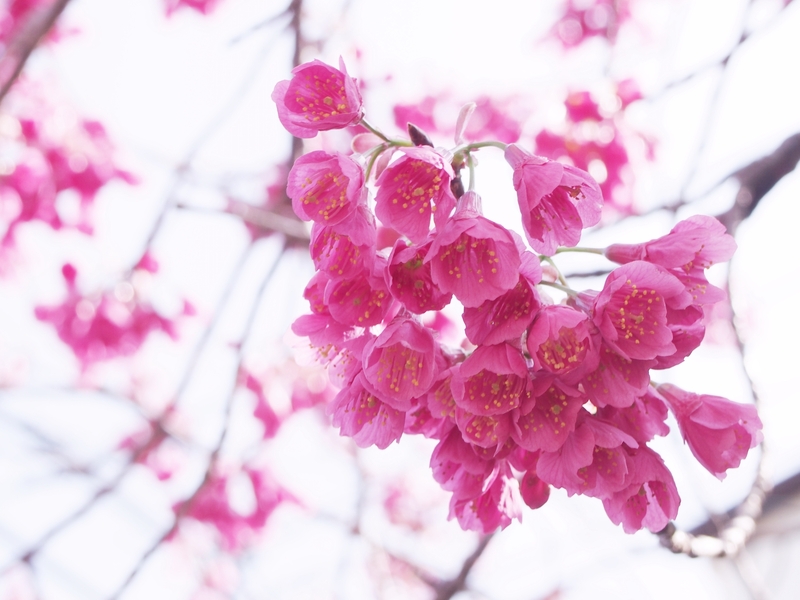 The Taiwan cherry tree is known for its vivid pink blooms that hang in bell-shaped clusters. Stock photo. But even the most beautiful landscapes need sprucing up every now and then. That’s where the LSU Hilltop Arboretum comes in. The facility will host the Julia Hawkins 103 Cherry Tree Birthday Jubilee this Saturday, February 9, from 9 a.m. to 12 p.m. Visitors are invited to celebrate Hawkins’ birthday with her at the arboretum’s Imo Brown Education Facility, to purchase one of 103 new Taiwan cherry trees, and to contribute to the arboretum’s Julia Hawkins Beautification Project, which will involve fresh plantings on the site and along Highland Road. To learn more about the event this Saturday, or to get involve in the project, visit the event page here. And read more about Hawkins’ own garden, which features flowering plums, white-barked birches and decades-old bonsai, in this article from the inRegister archives.